A complicated procedure is required when a company employs a foreigner. However, each company has to cut down its cost. Then, this office manages employment of a foreigner etc.,instead of your company. Unlike a Japanese employee, the law problem about a foreigner requires special consideration. Please see "EXAMPLES" on Top Page about this. Moreover, about these points, the foreigner who was not able to be employed can also be employed now because of a legal revision(e.g.the engineer of computer). So, please utilize this office as a special legal adviser for employing a foreigner to become more advantageous than other companies. If an Legal Adviser Contract is concluded, you will be quickly told about the information on the newest and useful employment. Consequently, your company can also manage employment appropriately. In this office, legal knowledge and the quantity of experience differ from other offices. 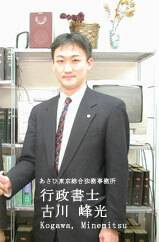 For example, the representative of this office has passed many legal qualifications which the Japanese government has authorized. So, suitable advice is possible. Moreover, in "The Japan Business Law Examination" by Tokyo Chamber of Commerce and Industry ,which is an examination of the capability of the lawyers who are doing business of judicial affairs, the representative of this office has the score of the 1st ranking in Japan in 3531 persons. Furthermore, using such capability, the representative of this office has experiences in which he educated students about law, such as students in the Department of Law at the University of Tokyo and the Keio University,etc.. Moreover, he has experiences in which he taught the employees of the judicial-affairs section of companies about the knowledge of judicial affairs. Furthermore, as it is in this English page, in this office, it is also wonderful that our service can be offered in English. And in this office, business with high quality in this way is offered, and, moreover, the fee is reasonable. From now on, this office will offer more legal business. Please ask us at this opportunity. Please commission us to take the necessary procedure for Visa Application. This office offers many law business centering on the legal rights of foreigners. In this field, there are few specialists in Japan. Moreover, even if there is a specialist, since he demands too much money, a foreigner cannot consult him freely. Then, this office is popular as a law office which is easy to use. Please consult us on every trouble. This office is authorized by the Japanese government. Your privacy is protected. We have protected very carefully the information of an individual or a company . Now, Japan is in a very severe situation. This office is managed in order to overcome this critical situation. We believe that activity of this office will be useful for Japan and the world.